Fortnite's cartoonish art style and freewheeling aesthetic encourage artists to take their turn designing​ new content for the game. In that creative spirit, two Reddit users decided to take a crack at designing some weapon wraps. 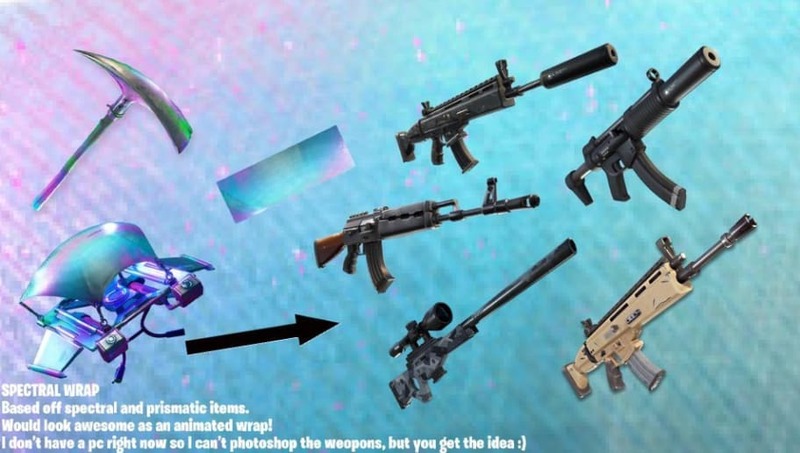 The first two weapon wraps are by user ​ThatMysteryGuy_uk, who shared his creations on the ​Fortnite subreddit. Both of his ideas center around the reactive mechanic Epic Games has already introduced to skins. The first wrap, which MysteryGuy calls the Reality Breaker, depicts the game's rifts. As the player racks up eliminations, the rifts on the gun grow, and even change from blue to purple. ThatMysteryGuy_uk's second concept changes based on the rarity of the weapon the player picks up. Common weapons receive the gray wrap, uncommon the green, rare the blue, epic the purple, and legendary the gold. The wrap could also work with vehicles based on their actual availability rather than on the standard rarity tiers, as vehicles don't currently have assigned rarities. Alliplayisgamez designed the third skin and shared it to Reddit. Alliplayisgamez calls the skin the Spectral Wrap. The design is based on spectral and prismatic items. While it isn't as ambitious as ThatMysteryGuy_uk's design, it's every bit as beautiful.